Ahmad Syarif brings his expertise in regulatory analysis, stakeholder mapping, and crisis management to BGA clients in a range of Indonesian business sectors. 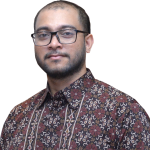 As a research analyst with a keen understanding of the country’s policy-making process, Syarif helps clients identify the political and economic risks of doing business in Indonesia. Before joining BGA, Syarif worked for six years as a government affairs specialist for various consultants. At MediaComm, a Jakarta-based government and media relations firm, Syarif handled crisis management and grassroots communication relations for clients across the banking, infrastructure, energy and the consumer goods industries. He provided research and analysis for Rupert & Clark, Global Vision, a California-based risk-assessment company, and prior to that was project coordinator at Matari Advertising. Syarif holds a bachelor’s degree from the Faculty of Communications Science of Padjadjaran University in Bandung, West Java. He obtained a master’s degree in sociology and politics from the University of Birmingham, United Kingdom.